Natural style comes from the heart and soul. Celebrities hire teams to portray an appearance which may or may not be genuine. You really take notice when you find someone who’s style naturally comes from within. There is a chef in Atlanta who’s food, restaurants, and market all have a simple, elegant, and relaxed style. You feel welcome when you walk in the door. Dining at her restaurants is a true culinary experience. It is why I was thrilled when Anne Quatrano’s new book Summerland: Recipes for Celebrating with Southern Hospitality arrived at my door. I immediately looked through the book and one recipe caught my attention; Meyer Lemon Gelato. The book goes way beyond a typical cookbook. It takes you through the seasons with recipes, entertaining ideas, and more. The photography is stunning. Summerland is the name of Anne’s family farm which supplies much of the produce for her restaurants. It is farm to fork at it’s finest. I’ve had the pleasure of dining at Bacchanalia and it is one of the best meals I’ve had. Each course was perfectly executed and brilliantly paired with wine. I’ve experienced Anne’s cooking and now I can make her wonderful recipes at home. 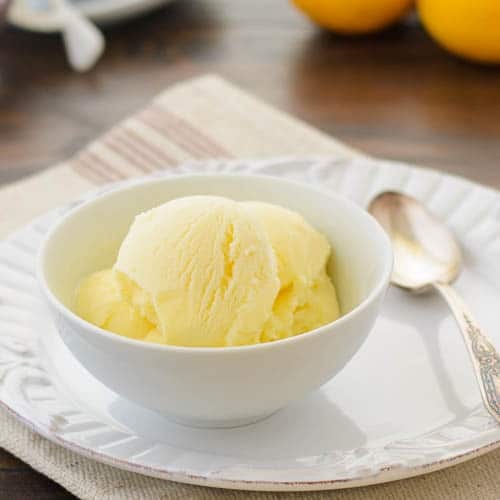 Meyer Lemon Gelato has few and simple ingredients. Milk, cream, eggs, sugar, and fresh Meyer Lemon juice and zest. Preparation is easy with her instructions. Before you know it, you have a smooth, creamy, sweet frozen treat. It is the perfect ending to a fall meal which is detailed in the October section of the book. Is there a chef in your area that is inspiring with their style? Anne is certainly one in my area. Be sure to visit her restaurants and market if you are in Atlanta. Meanwhile, I recommend her beautiful book and you can get it on Amazon by clicking the photo of it (affiliate link). 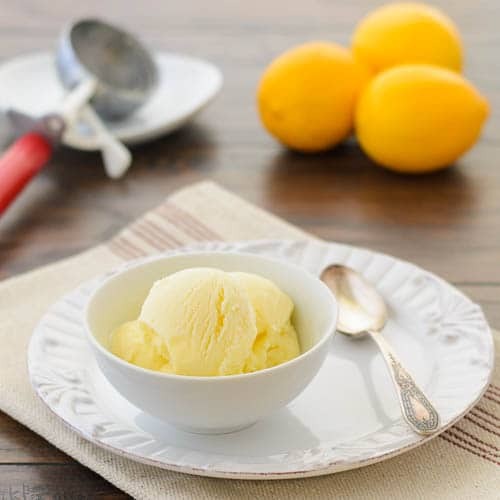 A recipe for Meyer lemon gelato. Milk, cream, sugar, eggs, and fresh meyer lemon juice and zest are blended and churned to make a simple and sweet frozen treat. In a heavy-bottomed medium saucepan, combine the milk and cream over medium to low heat. Cook, stirring occasionally so a skin doesn't form, until tiny bubbles form on the surface. Remove from heat. In a medium heat-resistant bowl such as Pyrex or stainless steel, whisk the egg yolks until smooth. Gradually whisk in the sugar until it is well incorporated and the mixture is thick and pale yellow. You can do this by hand or using a hand mixer. Very slowly pour the hot milk-cream mixture while whisking continuously; it's important to pour slowly so the eggs don't curdle. Return the mixture to the saucepan and place over low heat. Cook, stirring frequently with a wooden spoon, until the custard is thick enough to coat the back of the spoon, 5 to 7 minutes. Do not bring to a boil. Gently whisk in the lemon zest and juice. Strain the custard through a fine-mesh strainer into a clean heatproof bowl and place plastic wrap directly on the surface to prevent a skin from forming; let cool for 5 minutes. Meanwhile, make an ice bath by filling a large bowl with 2 cups ice and 2 cups cold water. Place the bowl with the custard in the bath; uncover and stir the custard with a spoon until cooled. Once completely cool, cover and refrigerate until very cold, at least 4 hours and up to 24 hours. Pour the custard into the container of an ice cream machine and churn per the manufacturer's instructions. Transfer to a clean plastic container and freeze for at least 2 hours before serving. Total time does not include time for refrigeration of custard (4 to 24 hours). Recipe © copyright 2013 Anne Quatrano from Summerland: Recipes for Celebrating with Southern Hospitality. Used with permission by Rizzoli International Publications, Inc. Disclosures: I received a copy of Summerland: Recipes for Celebrating with Southern Hospitality at no charge and was under no obligation to post a positive review. All opinions are my own unless otherwise stated or contained within a guest post. This post contains affiliate links. It is a wonderful recipe and book. You should get a copy and see what a great book it is. I love the chef at a restaurant in my town, The Kitchen Table. I am so excited to be going to an apple harvest special dinner there tonight. This is my first time to your blog. I love that your site is navigable by recipes, gardening and wine. I think this is the beginning of a beautiful friendship:)!!! Pinning this recipe! It’s so nice when local chefs have events and special dinners. Thanks so much for the compliments on my site and I hope you will visit often. Double thanks for the pin. It’s a thing of beauty! Love the color! Dang, I just used the last of my Meyer lemons from my stash! Must remedy that. Thanks Kim and you know your kind words always make my day. That looks so simple but so wonderfully refreshing! It is and my husband has really enjoyed it. Last night he got a bowl and shared a bite or two with me. It ended my day so well. Just right. You know, I’ve never had meyer lemons before. 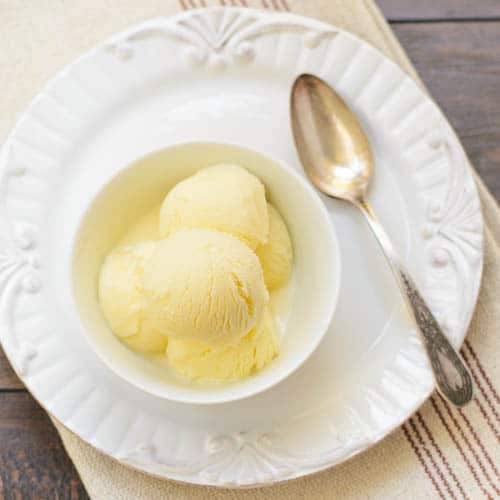 I love lemon in general, especially ice cream, so I’ll have to grab a bunch and make this gelato! I only had Meyer lemons recently after they finally became available in Georgia (thanks to them now being grown in Florida). They used to only be available on the West coast. Beautiful! Bookmarking this for when my Meyer lemon plant has mature fruit! Thanks Lori and I’m envious that you have a Meyer lemon tree. They don’t do well here in Georgia.